Last week I shared with you an easy, and disposable, cupcake stand. 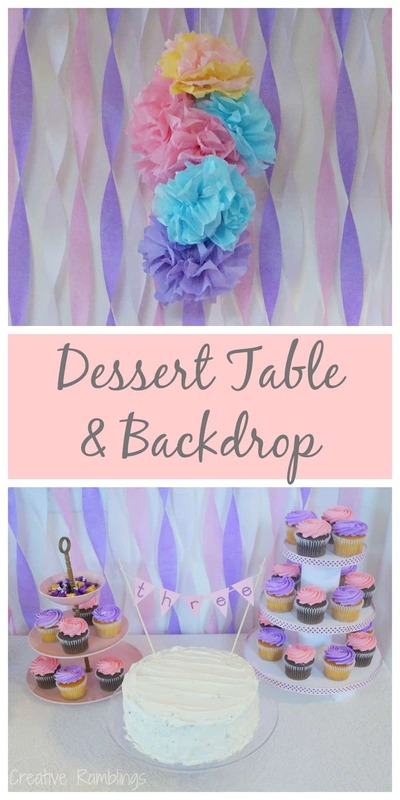 Today I want to pan out and show you the dessert table I put together for Little Lady’s 3rd birthday party. We didn’t have a lot of sweets, a carrot cake and cupcakes were the main fare, along with a tiered tray of brownie bites, chocolate, and graham bunnies. Just enough sugar to keep the kids going. 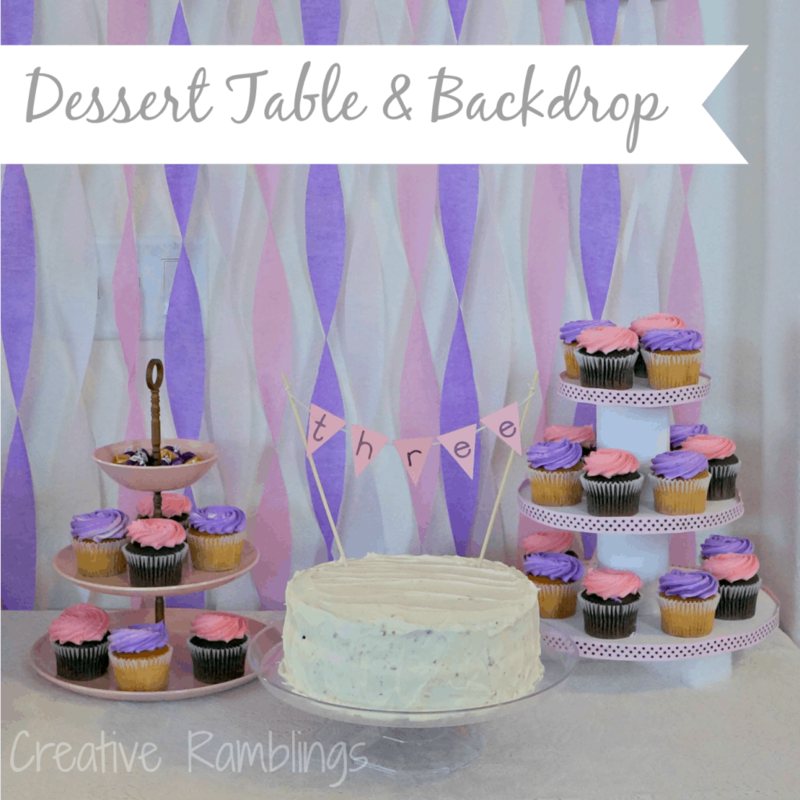 I found the perfect spot for a dessert table, just off my kitchen in the living room. We have an open first floor so it all flowed nicely together. 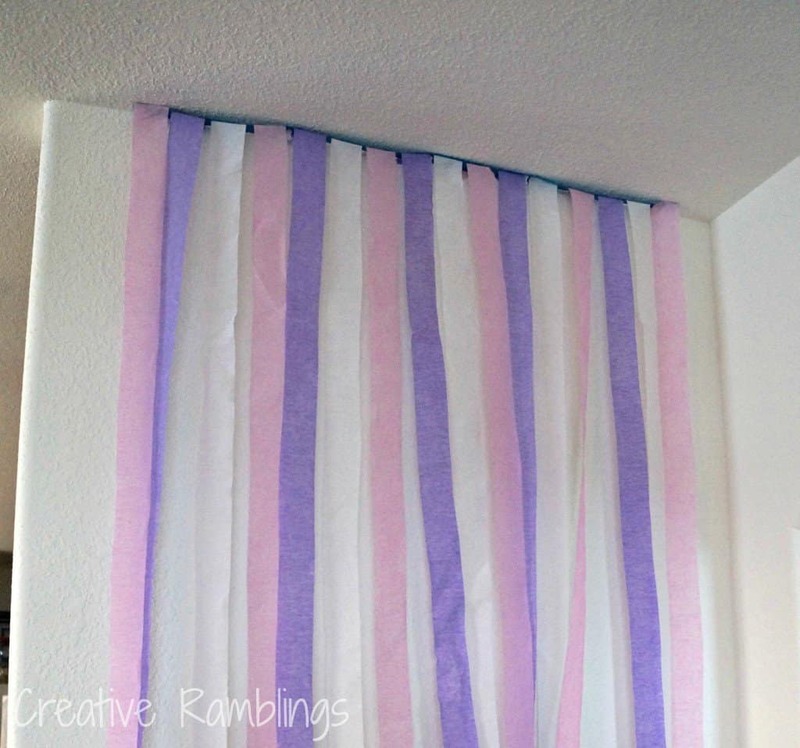 I covered the table in a lace tablecloth and the wall in purple pink and white streamers. 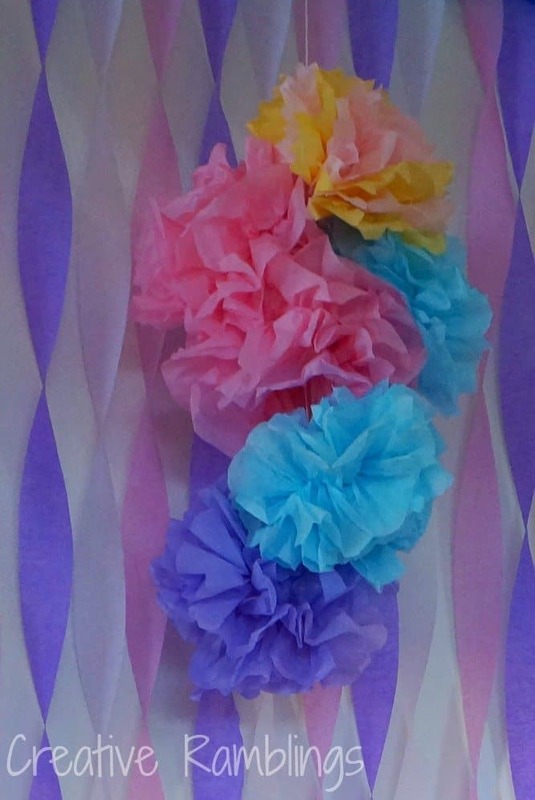 I added a cluster of tissue paper pom poms to the mix to finish it off. 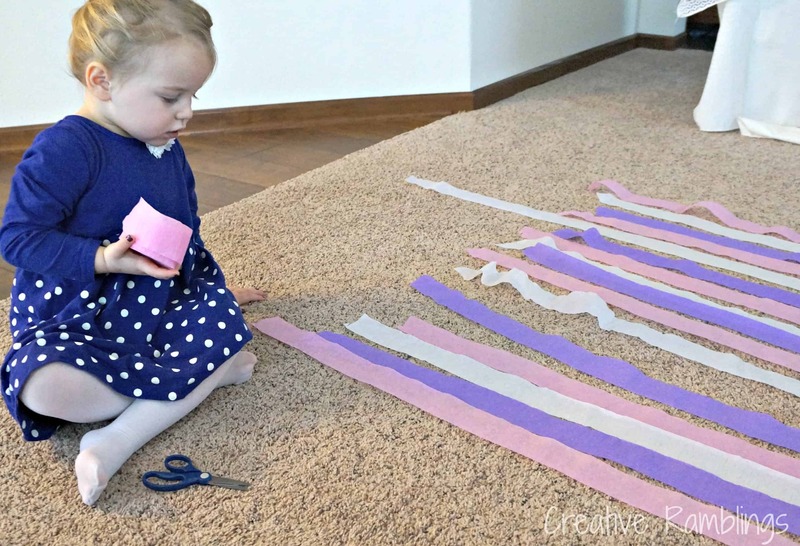 These are really easy to make, follow the link for a tutorial. The backdrop was pretty easy. I even involved Little Lady who loved measuring and cutting the crêpe paper. I cut strips of crêpe paper and used painters tape to secure them all together at one end. I doubled the tape on front and back of the crêpe paper. Then I used thumb tacks to attach the strip of tape to the ceiling. From there I twisted the crêpe paper and secured each piece with tape at the bottom behind the table. Voila, easy dessert table and backdrop. How do you display your sweets for a party? Cute backdrop! Love the way you hung up the tissue poms. Thanks Amy, they added such a fun touch. Totally cool, and thrifty backdrop! Saw your link on f.b.! Awesome backdrop- we did a similar one for my daughter’s birthday party! Oh thank you. I will stop over and check it out. Thanks, I’ll stop over and check it out. I love how this turned out and it looks so easy! Pinning! Sarah! This turned out beautifully! And I think I could even handle the streamer part, lol. Thanks so much for sharing at Hit Me with Your Best Shot! Hope to see you back tonight! Thanks Abby, you could totally handle it 🙂 I’ll be back tonight. I love how easy this is! It would be great for just doing a fun photo shoot too! Thanks for sharing at the party! Theresa @DearCreatives I’ll be pinning this to my photography photo props board! Hope your having a great week. Theresa, that’s a great idea. So many color and pattern options. Thanks for pinning!